A number of improvements have been made to the online editor to ease in the creation and editing of content. A new button creation tool has been added to the toolbar. 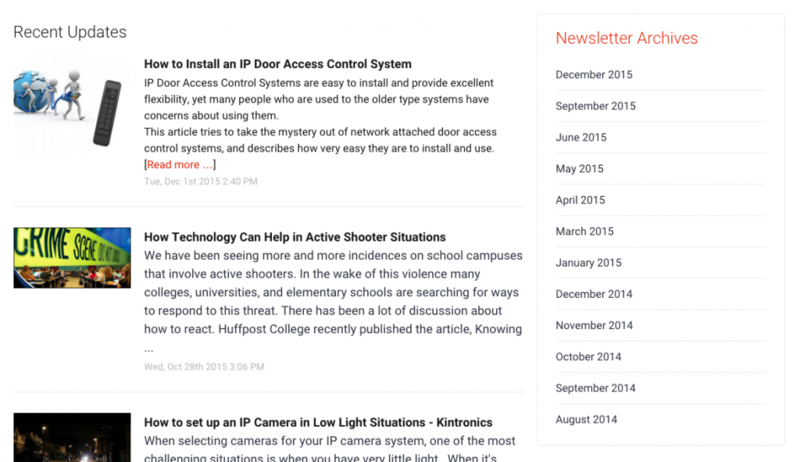 This allows colorful rounded buttons to be placed within blog articles and newsletters. Click this icon to insert a clickable button at the cursor location. The button can be linked to any URL, to a specific promotion, or to the URL associated with any other item in the current newsletter. The link tool has also been improved to make it easier to apply links to text and images in blog articles and newsletters. When defining the link you can select a specific promotion, or you can select the URL associated with any other item in the current newsletter. Alternatively, you can link to the anchor where an article appears in the newsletter. When a link to an anchor is clicked, the email will be scrolled to that location. 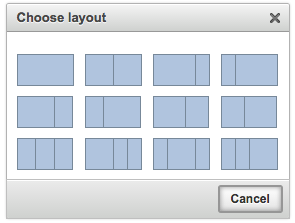 A new layout tool has been added to the editor toolbar. This allows responsive, mobile-friendly table layouts to be inserted into your content. This allows one, two, or three column designs to be defined. This is a great way to put pictures next to text or to align two paragraphs next to each other. The columns are formed by tables which appear side-by-side on a computer or tablet, and fold under each other when viewed on a mobile device. Column widths can be adjusted by changing the table widths, however, if the total width of all the table columns exceeds the width of the newsletter column, the tables will wrap under each other. This can also occur if any of the content you place within a table column is too wide. When sending emails and promotions to your contacts it is possible to personalize the message with information stored in the contact records. This is done by adding placeholder tokens into the text of a newsletter article or a section of the layout. For example, to add a “Dear John” introduction to an email, you would add this text: “Dear [[fnsme]],” There are many different types of tokens corresponding to the different data fields in contact records and your account profile. The Placeholder Token tool has been added to the editor toolbar to make the insertion of these tokens easier. Use this tool to select available tokens from a list and insert them into your content. Every ContentMX account now includes a companion microsite. The microsite is designed to be a landing page for your content and can store an archive of published newsletters. This is an ideal way to use content to improve your SEO results and collect your blog, social, and newsletter articles in one place. To include a content item on the microsite or to include a published newsletter item in the archive it needs to be assigned to a network which allows microsite visibility. The idea is that you can publish content for multiple purposes, but you can control what appears on the microsite by designating the publishing destinations that will also share content to the microsite. This is done at the time you define a network where you will see an option labeled “Display on Microsite”. Set this option to “Yes” if you want any content posted to this network to appear online. For example, if you have a newsletter that is always sent to an email network named “Subscriber List”, you would edit the settings for this network and set it to display the content. Once the network settings are changed, you should see past and future content published to this network appearing in the microsite. An Active Lead report pushes marketing metrics directly to the people in your organization who can make immediate use of the information. The Active Lead email is sent one day and again three days after the time of the mailing. The report contains key measures such as the open and click rate, but more importantly, it contains a section revealing recipient interest based on the content being clicked. The first step is to build a ContentMX newsletter that is designed to incorporate high quality, relevant content and lead generating promotions. The content you curate or that is created is selected to fit an editorial calendar that covers the key topics and issues that concern your readers. Clicks to learn more about any particular item can then be used to identify reader interest. The Active Lead report identifies the people clicking on the items and links in the newsletter. The items are listed in order from most popular to least along with the name, email address and phone number (if supplied in your contact data) of each contact. Customers have used Active Lead reports to inform their selling efforts. In particular, gleaning interest from clicks can help guide the conversation during a sales call. Without directly mentioning the report, a salesperson can use this information to guide the sales discussion and move the prospect more quickly from interest to purchase. 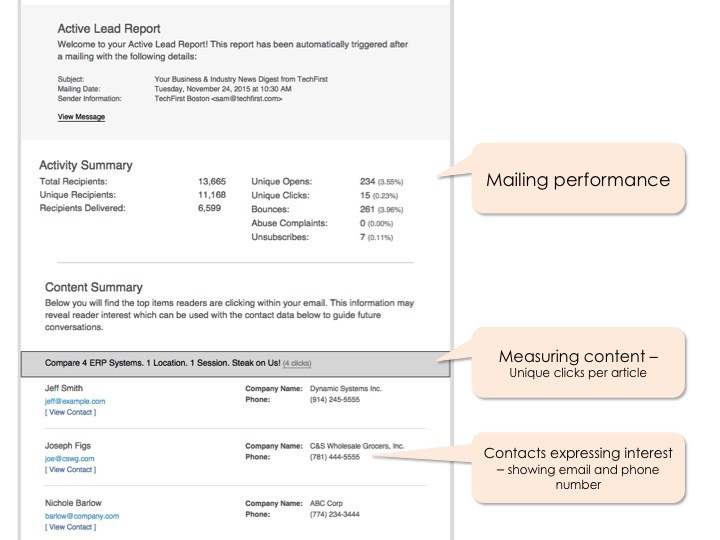 Active Lead reports can be activated for any account. Contact the support team if you would like to enable this feature.